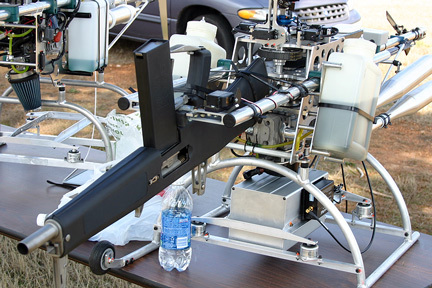 DefenseReview.com has received video footage of a weaponized version of the AutoCopter self-stabilized unmanned mini-helicopter being tested for the first time in sunny Huntsville, Alabama (The download link for this video is further down in this article.). The AutoCopter is made by Neural Robotics Incorporated (NRI), and the weapon portion of the package is a 12-gauge Auto Assault-12 Full-Auto Shotgun (a.k.a. AA-12 Full-Auto Shotgun) made by Military Police Systems, Inc. (MPS). DefRev first reported on the AA-12 back in June of last year (2005). NRI is calling the newly-weaponized AutoCopter the "AutoCopter Gunship. I can't imagine how do others start creating that kind of robot. Well, I believe everyone can create by their own by trying with patience of course.